We do not check credit because we primarily base our approvals on your job, affordability and friendliness. You have to have a smile and your payments have to be less than 20% of your net income to be approved. No joke, we only want to do business with friendly and happy people who appreciate the same in return! We are able to help you arrange outside financing; however, most everything we do is provided in-house. To calculate what you are approved for, multiply your after tax (take home) pay by 20%. Your weekly payment has to be less than this amount. For example, if you take home $375 after taxes, you qualify for a $75/wk payment (375x20%=75). Our average payment is $75/wk. We do look at some other factors such as time in the area, etc, but our main focus is on affordability and friendliness. It is as simple as that... no blood samples, no five page applications asking for 37 references, no invasive questions. If you can afford it and you are nice, you are more than likely approved! If you qualify for a payment that is less than what we have posted, you can put more money down to lower the payment to where you need it to be. For more information or questions, please do not hesitate to ask. Thank you for shopping with us! No Credit Checks! 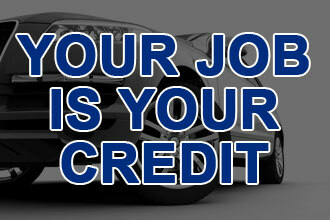 Your Job is Your Credit! APPLY HERE NOW!